Joy Creek Photo Archive (c) all rights reserved We received our specimen of Clematis socialis from a clematis researcher many years ago and have had it growing in our garden ever since. This is a rare and endangered plant in its type sites in Alabama and Georgia. Unlike most woody clematis, however, this is rhizomatous in nature, soon establishing a densely rooted colony with numerous stems each bearing a solitary urn-shaped flower. The four fleshy sepals of the flowers are prominently ribbed and have lightly colored margins. The sepals recurve at their tips. 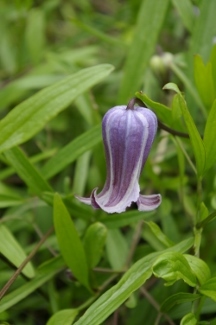 The foliage also is not characteristic of most clematis. It is linear and narrow, longer toward the base of the plant and shorter near the top of the stem. Not many clematis are fragrant, but here again Clematis socialis is unusual. The flowers have a delicious honey-like scent. We have allowed this to naturalize in a mixed border where we often find the flowers in unusual combinations with neighboring plants. The flowering stems can also be cut and used in a bud vase. Late spring to early summer. 12-15 in.